This quartet from Austin, Texas has a built a long and rewarding career out of making the theoretical soundtrack to the big bang. Always epic and boundless in their sonic expanse, Explosions In The Sky have now released a total of five acclaimed full-lengths into this side of our ozone layer. The group has acquired a loyal following through touring and having their music featured on popular shows and television spotlights such as the BBC documentary Lost Land of the Jaguar, All the Real Girls, Shopgirl, One Tree Hill, Love the Beast and The Diving Bell and the Butterfly, as well as various songs for the PBS documentary The Street Stops Here and Michael Moore’s Capitalism: A Love Story. The band even composed the score for the motion picture Friday Night Lights, as well as having their music extensively featured in the television series of the same name. Without being too boastful, you’re hard-pressed to find a dramatic sports montage or a gritty “real-life” scene in TV or film that doesn’t bear a striking resemblance to the template set in Friday Night Lights. The EITS aesthetic has kind of become a cultural institution on TV, so it is our humble opinion that this being their first ever music video is a very special moment for this band. “Last Known Surroundings” is the latest single from the 5th full-length album titled Take Care, Take Care, Take Care, recorded with a bit of help from Modest Mouse and The Walkmen producer John Congleton. The record has gotten some seriously great attention from Rolling Stone, stating this release is “as specific as Bach in its circling concentric melodies and as steadfast as AC/DC in its push to ecstasy.” This album debuted at #16 on the Billboard Top 200 during its release week. “Last Known Surroundings” is a gradually building and breaking track that explores various guitar tones aided by an onslaught of reverbs and delays, as well as cool drum fills to boot. Though there isn’t a vocal in sight, the song never loses its appeal for a moment, providing a new current of sound at every step throughout its eight minute romp. The video takes a hint from the spacey nature of the tune and sends the viewer spiraling through wireframe and outer space. If you have ever seen the visually stunning Hubble film last year, this video is definitely something along the lines of that, allowing the viewer to travel the nebulas of space in a way that is exhilarating and will definitely not be physically possible in our lifetime. The video starts out with wireframe particles that travel light years through wormholes to form a planet. After sprouting fully actualized natural landscapes, the planet then explodes once again into particles, restarting the circle of life. 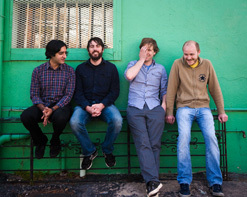 Explosions In The Sky is currently touring behind their release. The band is set to play at this year’s Bonnaroo Festival alongside bands like Arcade Fire and The Strokes. The group is also playing Lollapalooza, Capitol Hill Block Party with TV On The Radio, Oya Festival and Way Out West Festival with Fleet Foxes, Green Man Festival, and Haldern Pop Festival just to name a few continental and overseas appearances this summer. EITS will be headlining a tour this fall in the US and the UK as well. We’re are very excited to be working on this high profile project alongside the folks at Temporary Residence Limited and hope you will join us in exposing this otherworldly clip to your many cherished viewers. We would love to hook you up with the opportunity to catch the band live and the chance to sit down for a video interview, so please be in touch if this is something that you’d be interested in pursuing. We also have copies of the new record available for you to check out, so be sure to let us know if you’d like some! If you need more info, call Andy Gesner at 732-613-1779 or e-mail us at HIPVideo@aol.com. You can also visit www.TemporaryResidence.com or www.ExplosionsInTheSky.com to find out more about Explosions In The Sky and the tour dates near you.